Laundries - The Last Frontier? Once upon a time, the kitchen was considered nothing more than a functional space. It was tucked away from everything and the only job it had was to cook meals. There were no stone benchtops, splashbacks or designer fridges. As long as the meals were cooked then it did its job. And now, of course, everything has changed. The kitchen is one of today's houses biggest 'show off' features. It's open plan and its job is to impress. If you can cook a great meal in there it's a bonus! The bathroom was the same. What went on in there was so private the door was left shut. And you never ever showed it off to guests. Now, all that has changed. Homeowners practically rush visitors through the rest of the house to show off their bathroom. And they're spending a king's ransom to dazzle and impress. Will it become open plan too? I certainly hope not. Of course, this just leaves one room which doesn't get the 5-star treatment. Is the laundry the final frontier? It looks like it is. Nobody wants a room in their house they have to hide. Everyone deserves to feel a sense of pride anywhere they are. This is why we're seeing more and more people taking their laundry seriously. 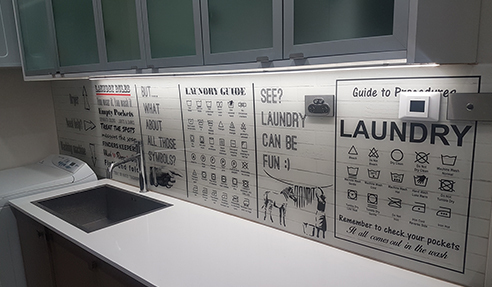 Innovative Splashbacks are supplying splashbacks for a growing number of laundries all over Australia. Take a look and see how people are creating laundries which are both practical and beautiful. Innovative Splashbacks produce Australian Made custom size, colour and digital print acrylic splashbacks for residential and commercial projects. See our latest projects www.facebook.com/InnovativeSplashbacks. See more about our luxury printed splashbacks here www.printedsplashbacks.com.au. I would like to enquire about Innovative Splashbacks.